This lithograph is taken from plate 5 of Emily Eden's 'Portraits of the Princes and People of India'. Eden wrote of the Akalis (armed Sikh irregulars): "Akalees or Immortals, Sikh religious devotees, being very wild in appearance and turbulent characters. 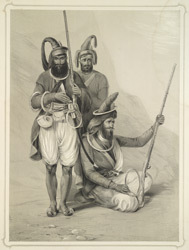 They formerly were largely employed in the Sikh armies and were often remarkable for acts of desperate courage, but their licence renders them formidable to any regular Government and Runjeet Singh gradually reduced their numbers, and broke their power by distributing them in small companies among his disciplined battalion; their blue dresses, their high-peaked turbans, the rings of steel, which they wear as the peculiar emblems of their devotion to the first great military leader of the Sikhs Gooroo Govind, and the profusion and variety of their arms make them very picturesque objects."